Ashada Navaratri signifies the nine power nights of the Goddess during the Vedic lunar month of Ashada (June-July). It is the ideal time to invoke the supreme goddess Lalita Tripura Sundari for multifold desire fulfillment and prosperity blessings. These nine nights are known as Varahi Navaratri and very auspicious to worship Lalita’s commander of the chariot, Goddess Varahi. 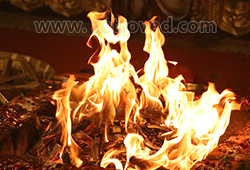 Propitiating Varahi can help deliver your earnest prayers to Mother Goddess Lalita so she can fulfill your desires and bless you with a prosperous life. 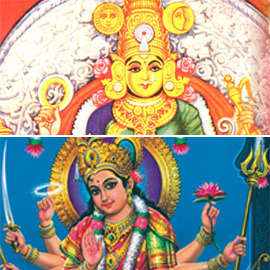 According to the sacred hymn Lalita Sahasranama (1000 Names of Goddess Lalita) from Brahmanda Purana, Goddess Lalita is described as the embodiment of the powers of creation, protection, and destruction. 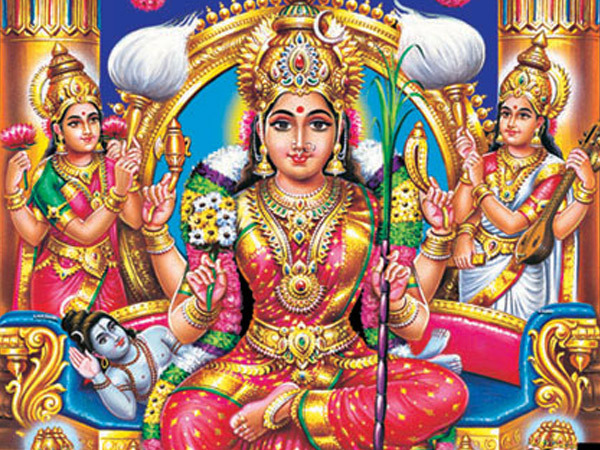 Worshipping Goddess Lalita, the Supreme primordial divine feminine power, during Ashada Navaratri can fulfill your desires, grant wealth, cure diseases, and give you a long, happy and prosperous life. Goddess Lalita Tripura Sundari is without form, and she is the energy (active form) of Sada Shiva, who is the representation of Supreme consciousness in passive form. The Sri Chakra mandala is the realization of Goddess Lalita in a geometric form. Invoking the Goddess through Sri Chakra Pooja is considered the highest form of worship in the Shri Vidya system. During Ashada Navaratri, along with the Divine Mother, her commander of the chariot, Goddess Varahi is invoked for her protection and wish fulfillment blessings. 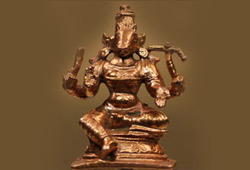 Varahi is the boar-faced archetype who is also hailed as Dandanatha Devi (one who holds the staff of Justice) and she can destroy all evil forces that obstruct your progress in life and paralyze your external and inner enemies, ultimately leading you to the highest form of wisdom and divinity. According to the sacred text Brahmanda Purana, invoking Goddess Varahi can destroy your sorrows, grant wealth and virtues and bless you with rewards for right actions. During this Ashada Navaratri, AstroVed will be performing the powerful ceremony of Navavarana Pooja (Sri Chakra Pooja) to invoke the blessings of Supreme Mother Lalita Tripura Sundari. The Sri Chakra, when given a 2D form, is known as Sri Chakra Yantra, and when given a 3D form (Pyramid form), it is called as Maha Meru. Sri Chakra has nine interlocking triangles (5 downward triangles and 4 upward triangles). The presiding deity of the Sri Chakra is Goddess Lalita, and she resides in the center focal point of the 3D form. 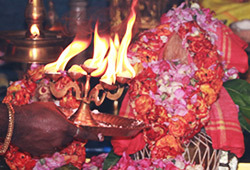 Navavarana Pooja is an auspicious ritual which is close to the heart of Supreme Goddess Lalita. The term ‘Nava’ means nine and ‘Avarana’ means screen or veil- signifying that only after crossing the nine layers of the Sri Chakra, one can reach the supreme divine energy of the Goddess. Our Vedic priest seeks the permission of the presiding deity of each layer of Sri Chakra and upon reaching the seed center, invokes Supreme Goddess Lalita Tripura Sundari for her blessings. As per the sacred text Lalithopakhyanam, participating in this ritual can fulfill your desires, give you prosperity and happiness and help annihilate negativities. AstroVed has selected a suite of rituals to invoke the blessings of Goddesses Lalita and Varahi during this Ashada Navaratri to welcome them into your life and enjoy their gracious blessings for prosperity and blissful well-being. The term “Ashada Navaratri” refers to the nine days in the Vedic lunar month of Ashada (June-July), which also corresponds to the Tamil month of Aadi. During this Ashada Navaratri, AstroVed will be performing Navavarana Pooja invoking the blessings of the Supreme Mother Lalita Tripura Sundari who resides in the Bindu (the seed center) of the Sri Chakra. Participate in Ashada Navaratri essential package rituals to access the supreme divine energy of the Goddess. The ritual is the carbonization of thoughts. Carbon is our information bearing atoms. 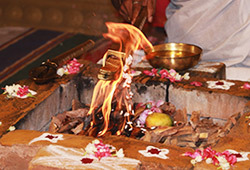 The carbon residue (ash) given out as Prasad is to be placed on the third eye of the participants and carries the blessings of the archetypes invoked. The term “Ashada Navaratri” refers to the nine days in the Vedic lunar month of Ashada (June-July), which also corresponds to the Tamil month of Aadi. During this Ashada Navaratri, AstroVed will be performing Navavarana Pooja invoking the blessings of the Supreme Mother Lalita Tripura Sundari who resides in the Bindu (the seed center) of the Sri Chakra. 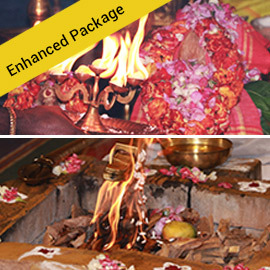 Participate in Ashada Navaratri enhanced package rituals to access the supreme divine energy of the Goddess. The term “Ashada Navaratri” refers to the nine days in the Vedic lunar month of Ashada (June-July), which also corresponds to the Tamil month of Aadi. During this Ashada Navaratri, AstroVed will be performing Navavarana Pooja invoking the blessings of the Supreme Mother Lalita Tripura Sundari who resides in the Bindu (the seed center) of the Sri Chakra. 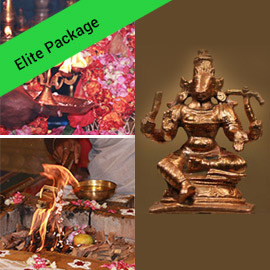 Participate in Ashada Navaratri elite package rituals to access the supreme divine energy of the Goddess. 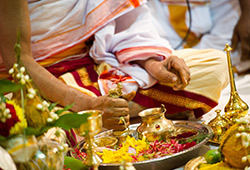 You will receive the product and sacred grey ash powder from the homa and Kum-Kum (Red Vermillion Powder), which will be blessed in the rituals. Keep this on your meditation altar and wear it on your forehead during meditation or at other times to expand the Divine blessings into your life. Book your individual Lalita Sahasranama chanting and Durga Suktam Homa during Ashada Navaratri to eliminate all hurdles on the path to success, ensuring a trouble-free life filled with happiness and joy. 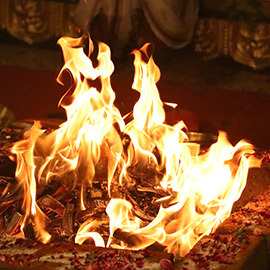 Performing this homa can ensure the divine protection of the Goddess and produce tremendous positive energy, which can form a powerful all-pervading protecting shield against ill effects and misfortune.